​Catch it, and you're left with an insatiable urge to return, time and time again, to this spectacular little island. We hear of the "bug" early in our visit and it sounds like a nice little catchphrase. But sure enough, we're soon bitten. Seduced by the uncomplicated, laid-back vibe, freshly sourced produce, friendly locals, rugged coastline, secluded bays and lush countryside. 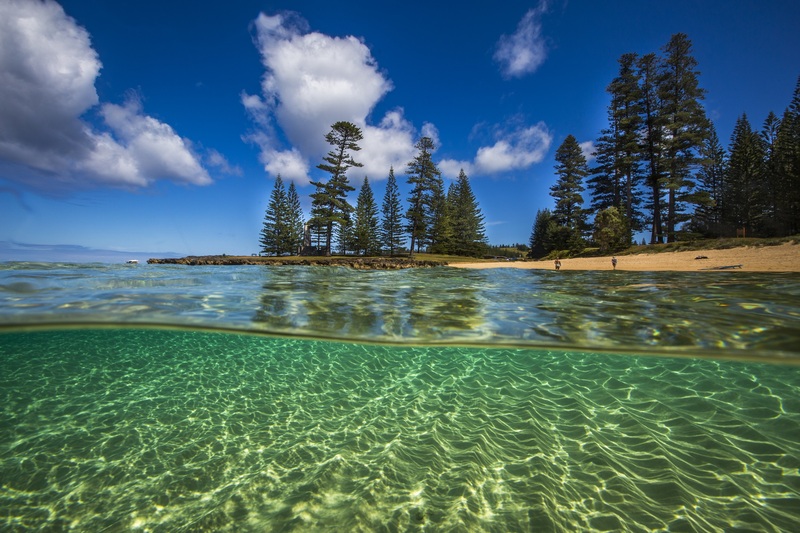 Norfolk Island may be small (8km by 5km) but the list of activities, natural attractions and secluded hideaway spots is long. The first impression is of mind-boggling colour — pine-lined valleys, dramatic sheer cliffs and deep blue water makes it nearly impossible to take a bad photo. With one roundabout, no traffic lights, clear air, limited mobile reception and picturesque winding roads, the worries of the "outside world" fade quickly. Cows — they are plentiful — have right of way on the roads and surely must be among the planet's happiest and well-fed bovines. On a night stroll, the absence of street lights makes for a spellbinding show, a blanket of stars filling a perfectly clear sky. Just over two hours from Brisbane and Sydney, everything seems easy. Fill your week with the many tours and dinners on offer, it could fly by. Kick back, savour the feel of timelessness and revel in the great outdoors — it still could fly by. With such diverse scenery, you find yourself parking the car often to stretch the legs (no need to lock it). The Hundred Acres Reserve walk is a relatively easy stroll through a picturesque forest of Norfolk pines and majestic, ancient Moreton Bay figs. Nearby, at Bumboras beach, a postcard-worthy boulder-lined bay beckons you to sit back and take it all in. Rocky Point looks down on Crystal Pool — as alluring as its name suggests but accessible only at low tide, and then just for the stout-hearted. Puppy's Point and jaw-dropping Anson Bay boast stunning sunsets and plenty of grassed picnic and barbecue space. The convict ruins and Georgian homes of Kingston flank the reef-fringed Emily Bay lagoon, which with its calm turquoise water and golden sand is the perfect swimming beach. With one-third of the island natural park or reserve and 60 unique plants, there is a constant vista of vivid colour to take in. Locals take pride in showcasing food as nature intended — seasonal, free-range and bursting with flavour. The paddock-to-plate philosophy is front and centre. At the popular sunset fish fry with Pinetrees Tours, we sit on the cliff top as a colourful array of salads and local breads are laid out to accompany the seemingly endless, delicious supply of fresh-caught trumpeter and king fish. At Golden Orb cafe, in a secluded garden setting and overseen by the jovial Jack and Caz, a smoked bacon and egg roll, and smashed avo (tree out front) are breakfast highlights. The Olive also has a genuine warmth and may boast the best steak sandwich I have encountered while offshoot, the Olive Branch, serves lunches at the historic golf club where I finish a round with king fish and crisp chips, gazing back over lush fairways to the ocean. The island's history is at once dramatic, fascinating and arresting. Heritage-listed Kingston, backing onto Slaughter Bay, is irresistible photo fodder but the stories behind the ruins run deep. I'm lucky enough to share a coffee with Arthur "Onion" Evans before joining one of his tours covering the four periods of Norfolk history — Polynesian; European discovery/colonial settlement; penal settlement, and the Pitcairn Islanders' arrival in 1856. An encyclopaedia of knowledge, Arthur paints a stark picture of the penal settlement, a dark period of unfathomable punishments that seems inconceivable among the modern beauty of the ruins. Kingston boasts four museums, each with an impressive collection of relics, while Cyclorama, the product of nearly two years' work from local artists, brings the story of the mutiny on the Bounty to life with a 360-degree display. Many of the current population of about 1800 are descendants of the mutineers. We nibble around the edges of the many tour options. The three-course Progressive Dinner comes highly recommended and does not disappoint, serving up a superb taste of Norfolk home cooking while hosts share the attractions, and challenges, of living in a slice of remote paradise. On the Ghost Dinner Tour, our group dines in a penal-era Georgian home, served by a ghostly white woman in costume who proceeds to entertain and rattle us with chilling stories of the supernatural, past and recent, during a lantern tour of ruins and abandoned houses. Bushwalking is diverse, with the 8km of tracks as challenging as you choose — and rest easy, no snakes here! My dawn "stroll" takes me to the island's highest point, Mt Bates, with dramatic views and not a soul to disturb the sounds of birds. The return, via the Bird Rock Track, showcases rich tropical vegetation and yet another breathtaking clifftop view — but be prepared for a steep exit climb. Electric bikes let us take in the sights without being floored by the terrain. Gym owner and bike operator Kelvin tells us the pedal-driven motor will help chew up the hills and, sure enough, we quickly find ourselves at the end of a private dirt track beachside. Our pier descent is timed perfectly — Dave from Charter Marine is there, boat brimming with sweet lip and enthusiastic guests from his fishing tour. Apparently the fish bite here, and often. Dave insists we take a bag of the fresh bounty, and it's mouth-watering on the resort barbie. The golf course, overseen by resident pro and former Brisbanite "Umi" (Andrew Umlauft), is as enjoyable to play as it is stunning to take in. As a long-time hacker, I find it impossible to feel stressed among the backdrop of Kingston's historic buildings. Umi, in a familiar tale, arrived here intending to stay three years. Twelve years on, seemingly bitten by the bug, he's still here, along with his wife raising their children in an idyllic lifestyle. The course demands regular photo stops and is kind to a battler — open, flat and with no water other than the surf alongside the spectacular par-three fourth. It is a pleasure to drive here — the terrain and winding roads make the island feel bigger but the surrounds are rich and rewarding. Take in the panoramic outlook from Mount Pitt, sweeping ocean views from the Captain Cook Lookout and on a Sunday, check out a traditional evening prayer service at St Barnabas Chapel, completed in 1880 by the Melanesian mission. The interior of the historic church is spectacular and the sound of it filled with voices for prayer awe-inspiring. Picnic in Paradise allows us to indulge in spectacular island food and scenery while barely lifting a finger. A fully stocked hamper is delivered to our room — a combination of antipasto skewers, sub sandwich, seasonal fruit and Norfolk guava cheesecake. We throw in a bottle of wine and savour at Two Chimneys reserve, one of many scenic picnic spots. Fresh produce and engaging locals take our final island tour to another level at Hilli Goat Farm. After a look at this family-run farm which churns out great cheeses, host Emily and husband Zach (a surf photography guru) unveil a gobsmacking feast. In island style, it's sourced from her garden or the neighbours', who happen to include her spearfishing brother. We label it the best food of the week — high, yet deserved, praise.